Use heavy-load 4-axle chassis. Adopt hydraulic power steering. The workover rig has high trafficability and high cross-country performance. The emission meets China 4 or China 5 standard. It is environmental friendly. 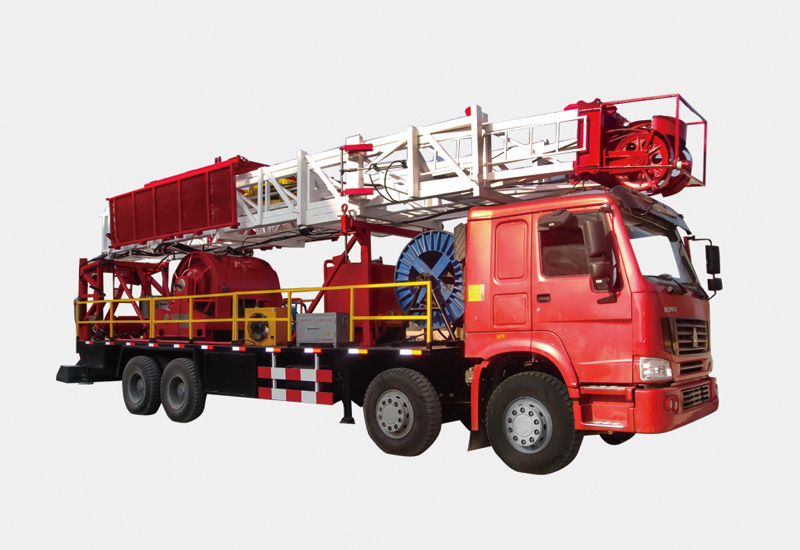 The derrick has front open and is a binodal suit FC mast-type derrick. It raises, stretches out and draws back by hydraulic pressure. Air cylinder lock is adopted. Driller operation room is equipped. All operations can be made in the operation room. Heating system is equipped. Air-conditioner can be installed. The master rotor brake adopts link mechanism remote control in the driller operation room. The hydraulic auxiliary unit is equipped to reduce the work intensity of driller. The winch input adopts gear drive. It has long service life and daily operation can be reduced. Adopt machine-power- hydraulic-gas integration technology to realize machine automation. Thus, the well repair efficiency and safety can be greatly enhanced, and workers’ work intensity can be reduced. Uphold “People First” design concept. Intensify safety protection and detection measures. XJ90 workover rigs are mainly used for shallow well workover, oil testing, fishing, and pump inspection; their main working systems include lifting operation system, rotating operation system and chassis walking system. This kind of product is equipped with complete configurations and has a wide range of application, the equipped drill floor and relevant components can carry on overhaul, sidetrack and well drilling operation. It has the characteristics of reasonable layout, compact structure, good moving performance, easy installation and easy maintenance. The winch auxiliary brake is water brake, pneumatic clamp brake or air-controlled water cold disc brakes are optional. Sucker rod hangers are optional.